Is Dry Eye a Big Deal? Dry eye, or ocular surface disease, may not sound like a major problem, but it can be! 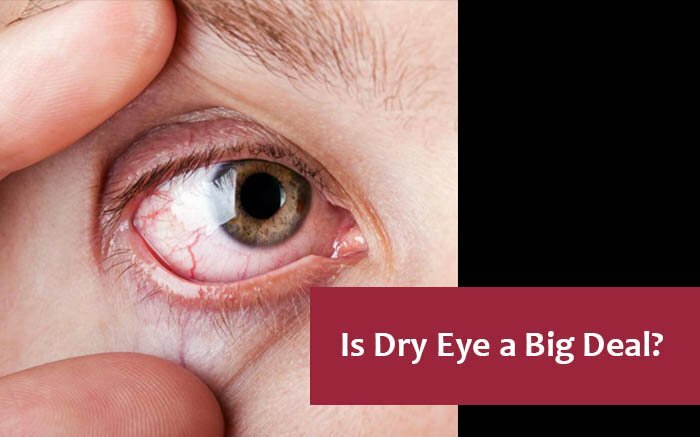 How do you know when you should visit an Orlando eye doctor, or ophthalmologist, for dry eyes? The answer is simple. If you have any symptoms of ocular surface disease, you should make an appointment with eye doctor Brian Haas at Boutique Eye Orlando (407)841-1490. Symptoms of this disease include redness, scratchy sensation, foreign body sensation, irritated, burning, blurry vision, and tearing. Yes, tearing is one of the bigger signs of dry eye because the eye waters when irritated and you aren’t making the right kind of tears. If you have any of these symptoms, you will want to schedule an appointment with Dr. Haas to have your eyes evaluated. Ocular surface disease is not just dry eye, it also includes ocular allergies, and blepharitis (lid inflammation). Dr. Haas will evaluate if you have one or all 3 conditions using various testing measures as the symptoms are similar between the 3. Ocular allergies will make your eyes red, dry, watery, and itchy. Testing for ocular allergies is easy and painless with our scratch testing which is generally on the arms and does not use needles. Within about 15 minutes we can determine if 58 common environmental local allergens are causing you problems and work to avoid and relieve the symptoms. Blepharitis is a condition that also makes the eyes feel dry and itchy, often accompanied with mattering and crusting in the mornings. Blepharitis is common and can be determined during an eye exam. If left untreated, it can cause mite infestations and permanent scarring. Blepharitis is easily treated with hygienic lid scrubs, and often a deep cleaning Blephex treatment. Also, special vitamin pills, called Hydroeye, can make a big impact on keeping blepharitis under control. In more severe cases, prescription medication may be needed. Lastly, Dry Eye itself is a huge problem. Not only is it painful, but it can cause blurry vision. Have you ever noticed your vision clears after you blink but then blurs a few seconds later? This is likely due to dry eye and not a problem with your eyeglasses. You need to have a nice, smooth tear film to look through. When your eyes are dry, it’s like looking through a swimming pool. Prescription medications may sometimes be necessary, but often dry eye can be kept under control simply by using over the counter measures. Dr. Haas also suffers from a dry eye and has created an eye kit which contains all of the products he feels help ocular surface disease the best. These items include warm compresses, a wonderful new artificial tear called Retaine (That helps blepharitis too! ), Hydroeye vitamins, and other items. The feedback from our patients has been fantastic. One patient improved 4 lines on the eyechart simply by using the eye kit! Ocular surface disease may start mild but can progress out of control if untreated. If you experience any of the symptoms, call our office to set up an evaluation at Boutique Eye Orlando with Dr. Haas (407)841-1490. Is it time for your annual eye exam?